Many of us in the preparedness community are concerned with collapse scenarios that involve civil unrest. Suspension of the Rule of Law, such as in the aftermath of a major disaster (e.g., Hurricane Katrina), we have to be prepared for traumatic injuries from a society gone rogue. One of the most important medical supplies to have on hand in this circumstance would be those that stop bleeding. 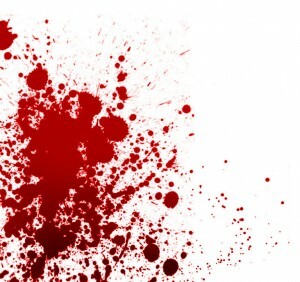 In studies of casualties in the recent wars, 50% of those killed in action died of blood loss. 25% died within the first “golden” hour after being wounded. 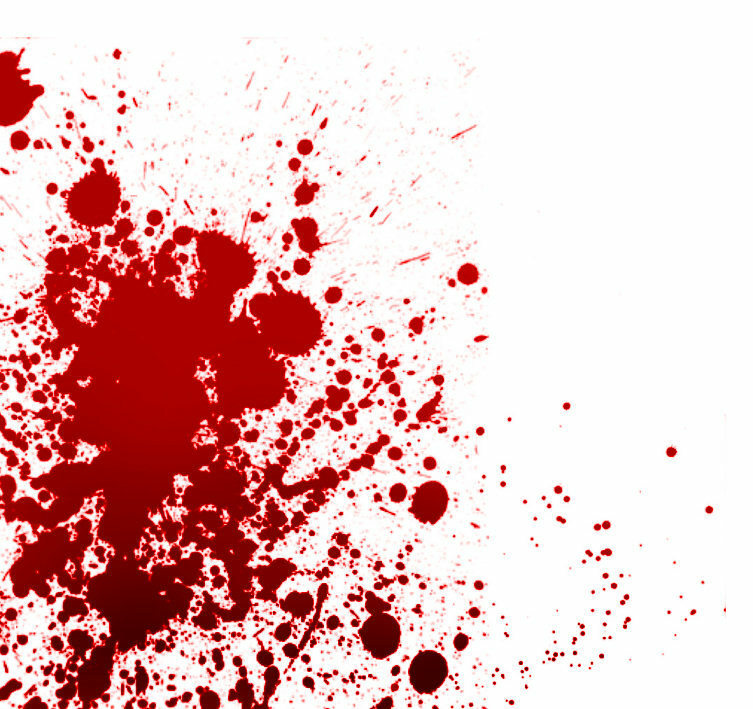 Therefore, the question we must pose is, to paraphrase Hamlet, “To bleed or NOT to bleed”. Ever since there have been traumatic injuries, we have been concerned with the death from hemorrhage. The Egyptians mixed wax, barley, and grease to apply to a bleeding wound. The Chinese and Greeks used herbs like bayberry, stinging nettle, yarrow, and others for the same purpose. Native Americans would apply scrapings from the inside of fresh animal hides mixed with hot sand and downy feathers. These treatments would sometimes save a life, sometimes not. The control of major hemorrhage rightly belongs to the emergency physician, paramedic, and trauma surgeon, but what if you find yourself without access to modern medical care? You may find yourself to be the end of the line with regards to a loved one’s survival. Although the thought of dealing with trauma yourself may be unpleasant, the issue cannot be ignored. You will have to learn to function as a survival medic if you want to keep it together, when things fall apart. In the last decade or so, there have been advancements in clotting agents (also known as “hemostatic agents”) that give us an additional tool for the medical woodshed. Knowledge of their appropriate use in an emergency will increase the injured patient’s chance of survival. Although there are various types of hemostatic agents on the market for medical storage, the two most popular are Quikclot and Celox. They are two different substances that are both available in a powder or powder-impregnated gauze. Quikclot originally contained a volcanic mineral known as zeolite, which effectively clotted bleeding wounds but also caused a reaction that burned the patient and, sometimes, the medic. As a result, the main ingredient was replaced with another substance that does not burn when it comes in contact with blood.. The current generation of Quikclot is made from Kaolin, the same stuff you find in Kaopectate and is so common that it is said to be what makes Georgia clay red. It does not contain animal, human, or botanical components. Contact between kaolin and blood immediately initiates the clotting process by activating Factor XII, a major player in hemostasis. The powder or impregnated gauze is applied and pressure placed on the wound for several minutes. Quikclot is FDA-approved and widely available; the gauze dressing is easier to deal with than the powder, but can be relatively expensive. Quikclot has a shelf life of 3 years or so, less if the packages are left out in the sun. One negative with Quikclot is that it does not absorb into the body and, some believe, can be difficult to remove from the wound. This was certainly true of previous generations but it is claimed to no longer be as big an issue, especially if you use the gauze dressing. Use an irrigation syringe to flush the wound after the gauze is removed. If more than one gauze is required, don’t remove the first one: Place the second gauze on top. In the The Journal of TRAUMA® Injury, Infection, and Critical Care , (Volume 68, Number 2, February 2010), the kaolin gauze was found to be as safe as standard surgical gauze. Celox is the other popular hemostatic agent, and it is composed of chitosan, an organic material taken from purified shrimp shells. As such, those allergic to seafood could possibly have a reaction to Celox. This “powder” product is actually made up of high surface area flakes. When these tiny flakes come in contact with blood, they bond with it and form a clot that appears as a gel. 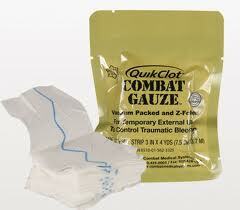 Like Quikclot, it also comes in impregnated gauze dressings, which are, again, relatively expensive. 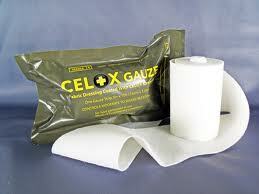 Both Quikclot and Celox gauze dressings have been tested by the U.S. and U.K. military and have been put to good use in Iraq and Afghanistan. To see both of these items in action, go to YouTube: “Celox demonstration” and “Quikclot demonstration”. Although effective, you shouldn’t use these items as a first line of treatment in a bleeding patient. Pressure, elevation of a bleeding extremity above the heart, gauze packing and tourniquets should be your strategy here. If these measures fail, however, you have an effective extra step towards stopping that hemorrhage. Be sure to include one or both in your medical supplies.